Cut at Emil Berliner Studio and mastered from the original tapes of SWR Music! 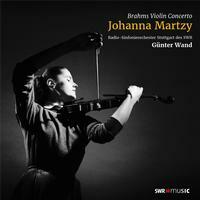 Johanna Martzy is one of the greatest violinist of the 20th century alongside the likes of Ida Haendel, Ginette Neveu, Erica Morini and more. There are primarily two factors causing her posthumous reputation to lag behind her true standing: Her international career was relatively brief and the repertoire she performed was and remained very narrow. However, the recordings we still have from her testify to a violinist and musician of the highest class who was not possessed by a demon compelling her to provide the world with as extravagant an interpretation as possible, but with unleashed verve, inspired articulation and perfectly clear control as a devoted medium of musical energies.